The mark of Maggie’s house was efficiency. The only running water was the stream down along the woodline at the edge of the pasture, but she had the next best thing. When she and Jim built their house they designed it so that the well was right outside the kitchen door on the wash porch. 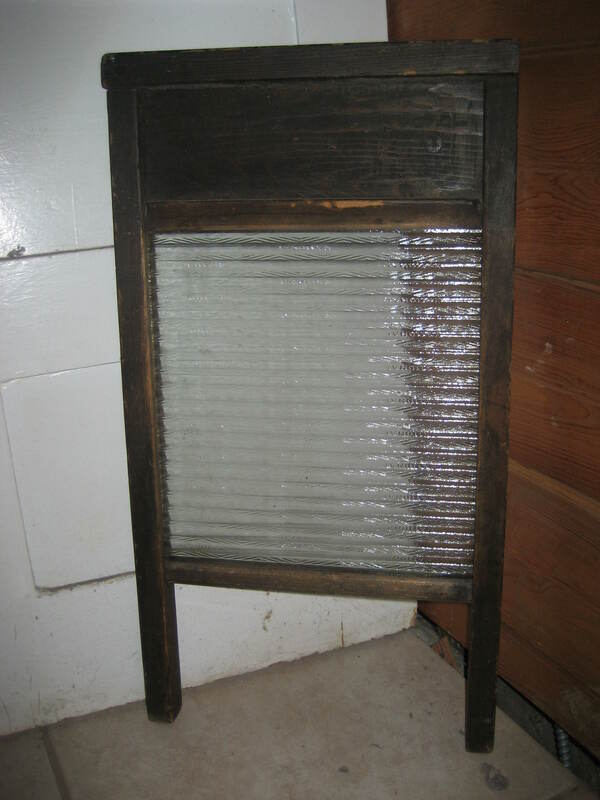 The wash porch was an enclosed porch where Maggie could easily scrub the laundry, hang it to dry on the nearby clothesline, and have water conveniently located nearby for kitchen needs as well. 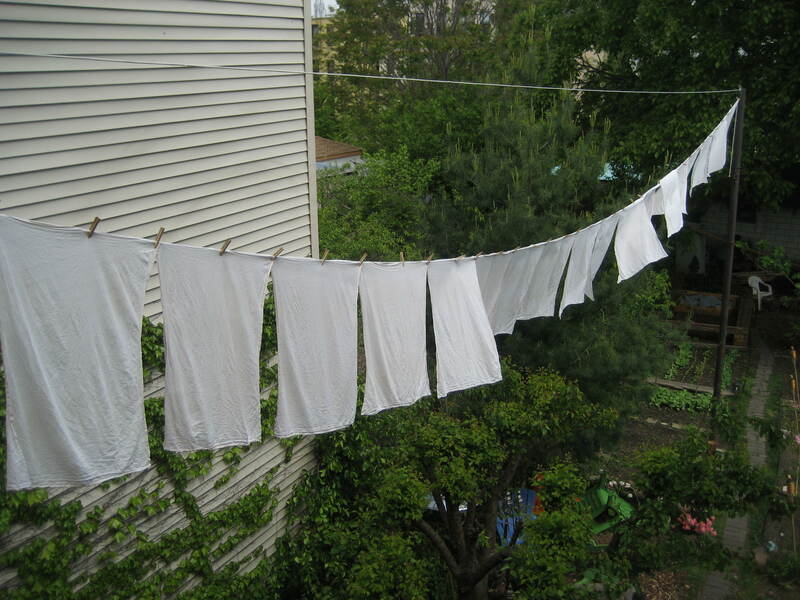 I’m sure that we are all thankful for our running water and washing machines, but the one laundry device of day gone by that I love is the clothesline. A clothesline is one thing that my current city dwelling doesn’t offer me. I miss my Texas clothesline. I miss the sunny days hanging out the clothes under the shade of the trees, and watching from the porch swing as the clothes dance in the breeze. There’s a little bit of Little House on the Prairie in me still. So if you cross over the East River to my house you’ll find things hanging everywhere… over the shower curtain, over the doors, over the backs of the chairs, across the closet doors, doorknobs, and even down the bannister in the stairwell. A girl does what she can. I’ve even tried to figure out how to string the 100 ft. rope of clothesline that I bought from one end of the apartment to the other, but I feel that either my husband or the landlords might object – my husband to walking through the obstacle course of drying diapers (our 700 square feet is enough of an obstacle course already), and the landlords to the large holes in the wall. So, for now I’ll be patient and see if the landlords ever install one outside for me. Until then, I guess the furniture will have to do. And if I ever do get a clothesline I have a basket of clothespins waiting. I started making this a few months ago and have found it to be quite effective at removing stains. 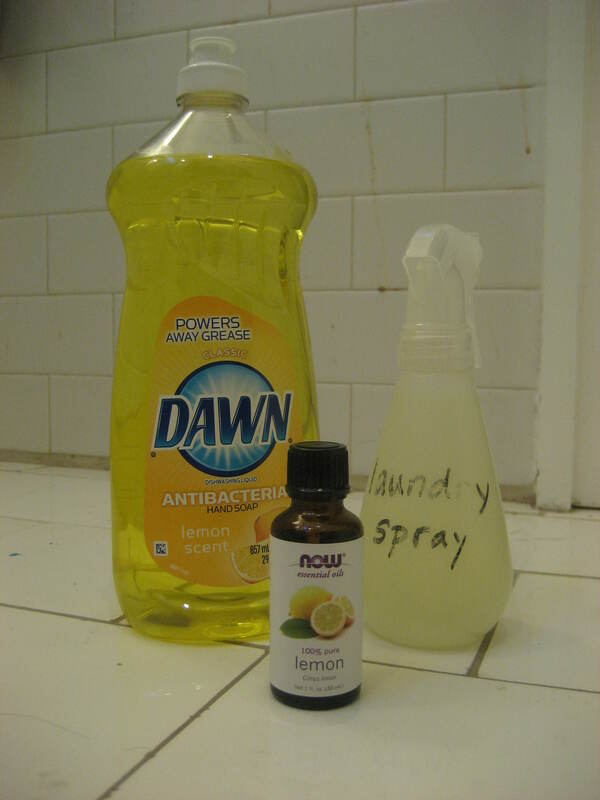 This dish soap loosens residue and cuts greasy stains, and the lemon oil disinfects and smells great! But, I’ve found it to be the most effective on my baby’s laundry. I haven’t had one stain from a poopy diaper yet. It removes the baby poop off the onesies and diaper covers better than any of the commercial laundry sprays that I used with my older two children. I spray it on, rub and let it sit until I wash. This powdered homemade laundry detergent works great in our HE machine. I wish I liked the washing machine as well as I liked this soap (high efficiency washing machines aren’t my favorite thing in the world as I prefer more water rather than less to get my clothes and diapers clean). But, here’s the recipe. Very simple. It only requires 3 ingredients…. 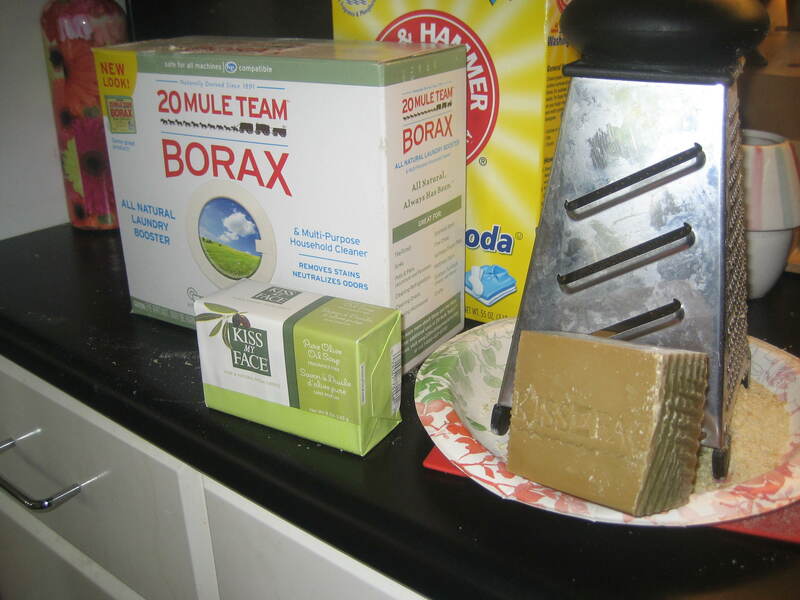 I grate my soap into a mixing bowl and then measure out my borax and washing soda into a gallon plastic bag. Then I add the grated soap and essential oils and shake the bag to mix before pouring it in my storage container. 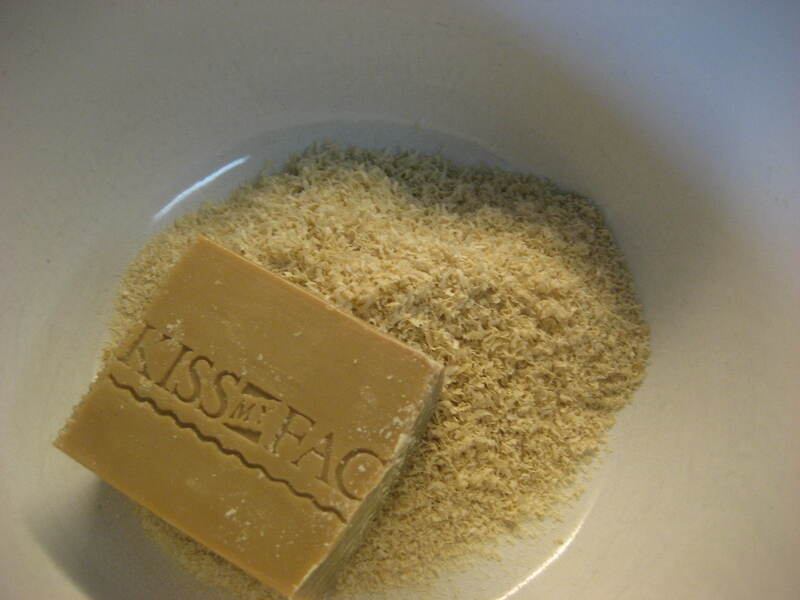 And I’ve recently started making half a batch of this soap and put the other half of the grated bar of olive oil soap in the shower for bath time It’s easier to grate just half a bar at at time an eaiser to handle a smaller bar of soap in the shower. I find that buying one box of borax and one box of washing soda is enough to supply you with about three batches of detergent. So, add three bars of soap and you’re all set. I find that one batch of detergent lasts me about 2 months. So, for less than $15 you have at least a 6 month supply of soap. I use 1-2 tablespoons per load (depending on the load size and soil level). The reason that this soap works so well for HE machines is the olive oil soap. Olive oil or true castille soap is very low foaming. So, there is no worry about your washer getting overloaded with suds. Be sure to read the ingredients on your soap though as some soaps labelled “castille” are made with coconut oil and other fats that create a high foaming soap. And for all you cloth diaperers out there you’ll be happy to know that this works great, great, great on my cd’s. I have a whole unopened bag of the expensive “diaper safe” soap that I’m not even using. The reason that I find that this homemade product is superior to the diaper soaps is that even though it rinses cleanly and cleans effectively (especially if you add some essential oils for disinfecting purposes) is that it does not release all the detergent residue from inside your machine which is especially important if you use a shared laundry facility or a laundromat as I do. I take my diapers to the laundromat once per week and do a warm wash to rinse, then a hot wash and I’m done with diaper washing for the week in one hour! One HOUR! can you believe it? And by the way, since writing the post at the top of this page, I now have a clothesline. Yeah! I love it for sunning my diapers. There is something very rewarding about hanging a freshly washed load of diapers out on the line and watching blow in the sunshine. If you try the soap, comment below and let me know how you like it. Happy washing! Sounds great! What is the best way to grate the olive oil soap? I either use my box grater (as pictured) on the side that you would use to finely shred cheese or the side that you grate parmesan. Or if you cut it up into 1″ blocks you chop it up in a good food processor if you have one. I’ve done that too. Usually I grate it though. If you use the side that you would grate parmesan it comes out very fine like a powder which is similar to the texure of the borax and washing soda so it mixes well. But it doesn’t have to be that fine to work. I usually mix it by pouring it all in a gallon baggie and shaking it until it’s all combined and I can see that the olive oil soap is evenly mixed. At what grocery store do you buy the borax? What’s your experience with its color-safeness? Both Trade Fair and Associated carry it. It’s usually in the laudnry asile on the top shelf. I hope that I’m remembering hte price of the borax correctly. The price tag got torn of the last box that I bought so I’m going from memory. 🙂 As for color safeness, It’s been fine for all our clothes. The only trouble I’ve had with this soap is that when we were travelling and I was using other peoples washing machines that some didn’t have a dedicated dispenser for powdered detergent and there were a couple of times that we found powder that didn’t dissolve on one of Matt’s shirts. It didn’t damage the shirt. It either washed out with the next wash or wiped off with a wet washcloth. If your machine doesn’t have a powder dispenser I imagine that you could also make a liquid version of this soap just by dissolving all the ingredients in hot water. To start, I would use an equal amount of hot water to the amount of powdered ingredients that you have. If it ends up being too thick just dilute it more. The olive oil soap can congeal if you dissolve it to a liquid form so I imagine that you would have to shake it before use to recombine everything. Borax and washing soda dissolve fine in water. One of my country friends, teased me about being a City Girl. I replied that I am still a Country Girl when it comes to my clothes line. I still hang 90%. When the kids were small, I even loved hanging diapers on a near freezing day, got me ‘out of the house’. Nothing like the ‘fresh air smell’ when you bring them in. Pingback: HE, Cloth Diaper Friendly, Homemade Laundry Detergent | Are We There Yet?